Several thousand people of Sarail upazila and Brahmanbaria sadar upazila, mostly supporters of local Awami League leader AKM Iqbal Azad who was hacked to death in Sarail on Sunday night, went on a rampage on Monday morning protesting the killing. 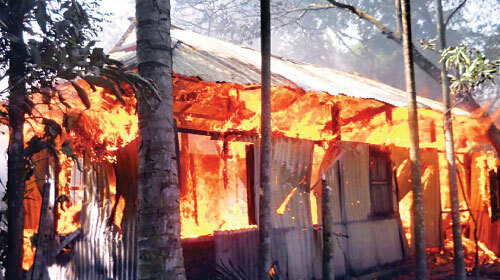 They also attacked and set fire on five houses, blocked the Dhaka-Sylhet highway at Biswaraod area and damaged six vehicles in Sarail upazilla under Brahmanbaria district. the three highways meet at Kuttapara. AKM Iqbal Azad, vice-president of Sarail upazila unit AL, was hacked to death by supporters of his rivals on Sunday evening in Sarail. The body was kept at the mortuary of BIRDEM after his first manaj-e-janaja at Kanditola field in Brahmanbaria town. Several thousand people took part in his janaja. No case was filed so far in connection with the killing. But police arrested a ruling party-backed Bangladesh Chhatra League leader, Motahar Sohel. Upazila AL president MA Halim, secretary Rafikuddin, organising secretary Mahfuj Ali, sadar UP chairman Abdul Jabbar, freedom fighter commander Ismat Ali and others have gone into hiding, local people said. Local people demanded immediately arrest of the killers and also urged the prime minister and home minister to take necessary action against the killers of Iqbal Azad and bring them to justice. over establishing supremacy in the upazila headquarters.